We are a fairly novice but very friendly band, who meet for practice on Thursday evenings between 7.30pm and 9.00pm each week. We also ring for Sunday morning service 10.15am – 10.45am. Visitors are very welcome to join us at these times. If there is a large group of you, please let us know you are coming by ringing Sarah Downes (Tower Captain) on 07846 217495 or email sldownes@msn.com. We are always looking for new ringers. Bellringing is a great activity for anyone of any age. (The only stipulation being that you need to be about age 9 to start – at any rate big and strong enough to handle the bells!). We have experienced ringers who are happy to teach newcomers or help ‘lapsed’ ringers to recover their rusty skills! If you are interested, please get in touch, or just pop up the tower one Thursday evening to see what happens. The entrance to the tower is the small door in the tower itself, which is unlocked at about 7.25pm on Thursday evenings. The ringing chamber is the first room you come to after 40 spiral stairs. Just come in and take a seat if we are ringing as you enter. If you have a group who would like to visit and ring our bells for a longer time, we have put aside one Saturday afternoon each month for visiting bands to book. (This is usually the first Saturday, but please see the calendar page for details). You can either use the contact form on our website, scrolling down to select ‘Bell Ringing Enquiry’ from the drop-down “Who do you want to contact?” field, or email Sarah Downes directly. 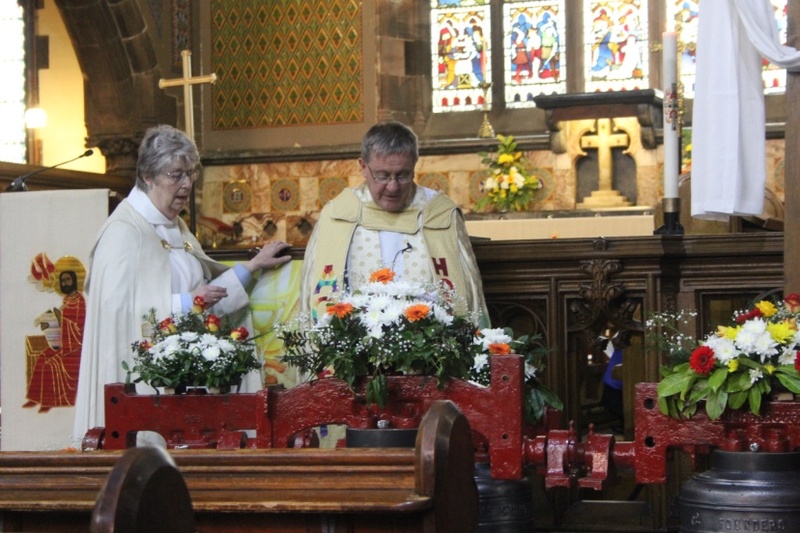 On the Sunday of the August Bank Holiday weekend, we achieved the first Quarter Peal on Bells at St Thomas’ Church. 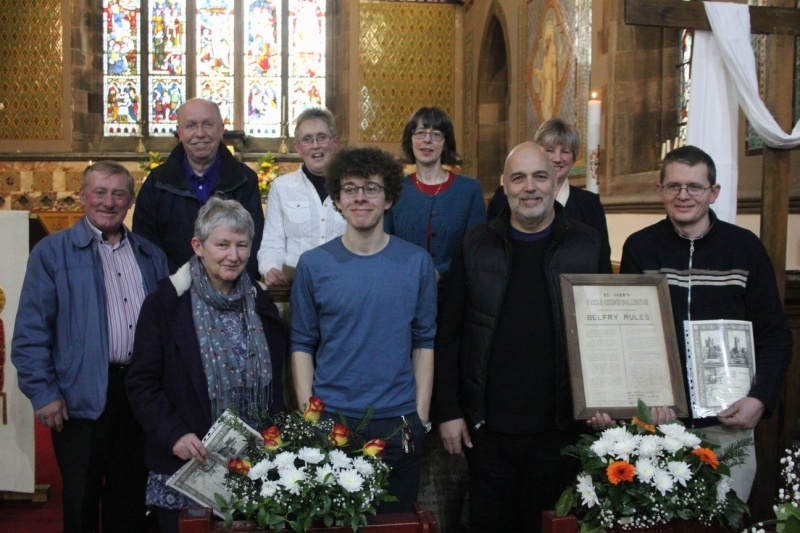 We rang a QP of Bob Doubles on the front 6 bells with a mixed band made up of three Stockton Heath Ringers and three of our trainers who make up our regular Sunday Service Band. This was also to mark the departure of our youngest ringer, Gregory Ridley, as he departed to Bath to begin his university course. Details were posted on the Billboard page of The Ringing World. There will be further open ringing at Stockton Heath on the Sunday afternoon between 1.30pm and 2.30pm, after which there will be another QP attempt, this time by a band of ringers from Prestbury/Bollington. 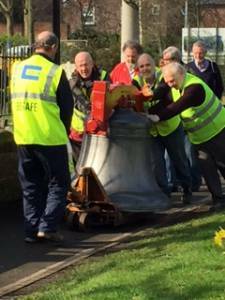 ( Bollington is where our back 8 bells were originally installed.) The festival will end with a short service in the church at 4.00pm. If you are coming to the Festival, you can park in the council car park (The Forge) adjacent to the church. £1 will buy you up to 3 hours parking, although all parking is free after 3.00pm and all day on Sunday. The entrance to the tower is outside the church, a small door to the left of the main porch. Toilets are in the church, which will be open during the festival ringing. Although St. Thomas’ Church was built with a tower big enough to hold a ring of bells, we think the money ran out before they could be installed back in the nineteenth century. 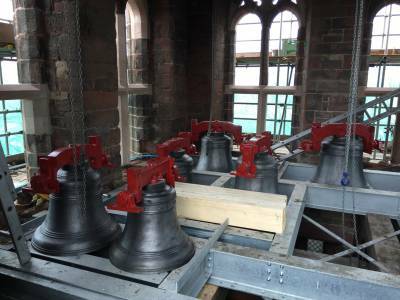 We are very excited that, owing to the generosity of St. John’s church in Bollington and the Chester Diocesan Guild of Church Bell Ringers along with those mentioned above, we have now installed a ring of ten bells in our tower. 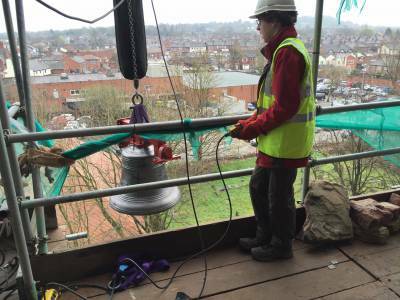 When St. John’s church closed several years ago their bells were removed and stored at Taylor’s Bell Foundry in Loughborough, and now in 2016 they have finally been winched up the outside of our tower and been housed in a newly built bell frame. Bells are very, very heavy! The steels are installed in the belfry. 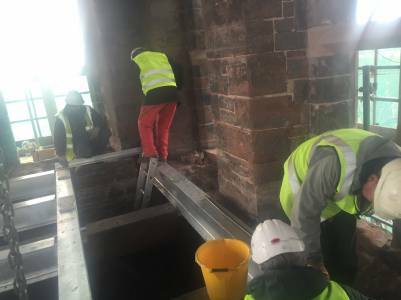 A bell is winched high up the tower and brought in through one of the windows which has had its stone tracery removed. The bells are laid out in the position they’ll occupy in the framework. 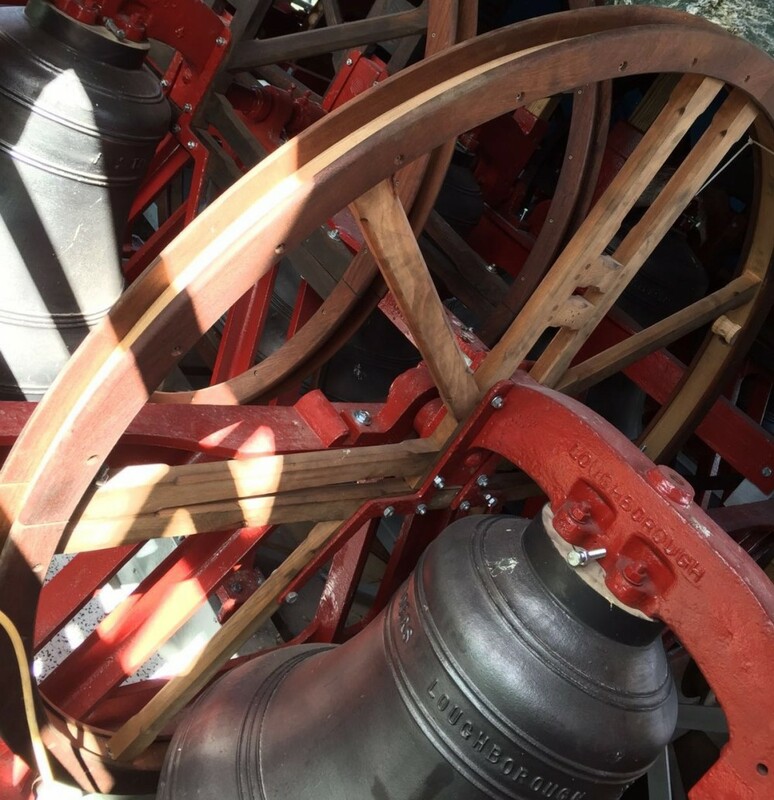 Each bell is fixed within a wheel on which it will turn as it’s rung. One of our ringers, Sarah, wrote an article for publication in the Ringing World all about our new band – to read it please click here. We had to wait until November 2016 before we could ring them, while the tower settled and the mortar dried after our extensive tower works, meanwhile continuing to train a brand new band of ringers. If you’ve forgotten about it since you read it further up the page, you can enquire about booking to ring at our tower by using our Contact Form and selecting ‘Bell Ringing Enquiry’ from the drop-down “Who do you want to contact?” field or Sarah Downes (Tower Captain) direct on 07846217495. 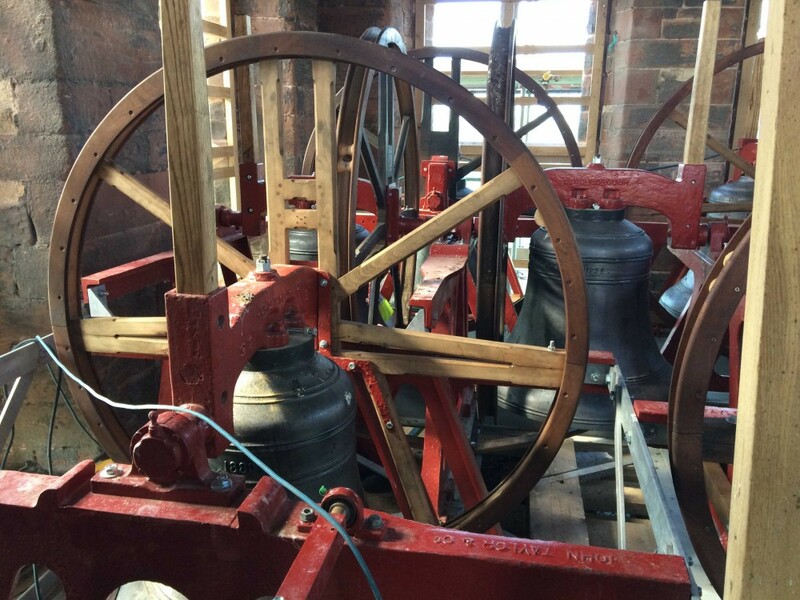 With the kind permission of Richard Westman (who rings in Runcorn and who is very supportive of our project and new band) you can see and listen to our bells.